A sunset shows the smoke billowing across Los Angeles from the top of Signal Hill on Saturday, Nov. 10, 2018. Photo by Stephanie Rivera. The Woolsey and Hill fires in Ventura and Los Angeles counties have led to unhealthy air quality across the Los Angeles region, including in Long Beach where a smoke advisory has been issued. The Woolsey Fire has scorched about 83,274 acres with 10 percent containment while the Hill Fire—where a Long Beach Fire Department strike team was deployed—has burned through 4,531 acres with 70 percent containment. The devastation has resulted in two deaths, hundreds of destroyed structures and at least three injured firefighters. Area of potential direct smoke impact due to fires. Graphic courtesy of South Coast Air Quality Management District. 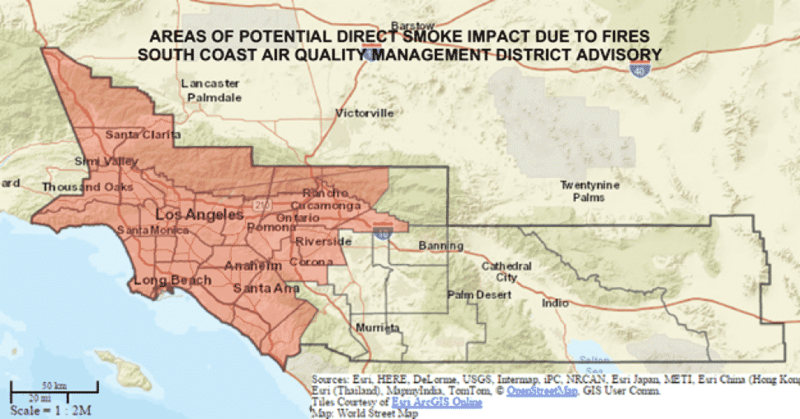 The wildfires have prompted the South Coast Air Quality Management District to issue smoke advisories today to impacted areas, which include Long Beach. The advisory is expected to be in effect through Monday afternoon. “Persistent offshore Santa Ana winds throughout Sunday and Monday will help clear some of the remaining smoke from the Northern San Fernando Valley and the LA metropolitan area,” air quality officials said in the advisory. The air quality in Long Beach and surrounding communities may be unhealthy for sensitive groups, such as people with heart or lung disease, children, older adults and people who are active outdoors. Officials said these groups should reduce prolonged or heavy exertion. Patrick Chandler, spokesman for SCAQMD, said the smoke means there are a lot of particles in the air that could be an issue for people with asthma. He warned that if people are smelling smoke they shouldn’t go out for long walks or play outside. They should curb outdoor activities in general, like lawn work. The National Weather Service has also listed Long Beach as nearing red flag warning conditions, which includes high winds and low humidity.